AFTERWORD (is that a word? ): After submitting this post I got a very helpful comment from Gedeon at the IconFactory who helped to explain why I was getting these errors and possible remedies. As it turns out the cynical conclusion I came to about my computer preventing me from becoming too addicted to Twitter by forcing me not to use it as much… was ironically accurate! As it turns out Twitter itself has a limit to the number of accesses to their site you can make in a given period of time, and obviously with Twitterrific running on my Mac, TwitBin running on Firefox on FreeBSD and m.twitter.com on my phone I consistently overshoot my allowed number. Twitterrific is a native Mac OS X application that displays tweets you and your friends have posted on Twitter, the microblogging site that I am hopelessly addicted to and post to almost every hour of every day. ASIDE: That advertisement for Camino popped up just before I took the screenshot. As you might have already read, Camino is my favourite web browser on Mac… how ironic! I've tried allowing the Twitterrific app in the new Leopard firewall settings panel and have checked all my other networking settings but it still shows these errors constantly. To get a version without advertisements you have to pay $20.00, but I want to know that what I pay for actually works :(. 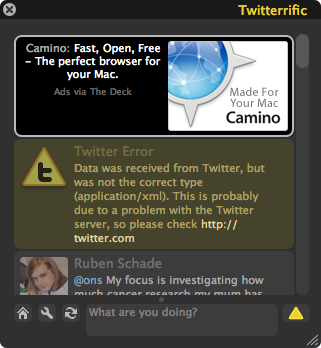 Anyone else had problems running Twitterrific on Leopard? I tried running Snitter as an alternative, but uninstalled it because it was giving me even more problems. Does my beloved MacBook Pro think I'm wasting too much time on Twitter and is trying to stop me posting to it? Is it an intervention on my computer's part? That's probably the reason!